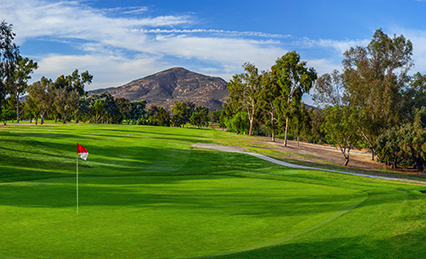 The opening hole at Mission Trails is reachable for the longest hitters. The ideal tee shot is down the left side of the fairway, avoiding the fairway bunker on the right. Depending on your tee shot, you must decide whether to lay-up or carry a short hazard that cuts across the fairway just inside of 150 yards. A single greenside bunker visible from the fairway protects the green. The second hole has a slight incline towards the green. Long hitters may elect to hit a fairway or long iron from the tee box. The left side of the fairway provides the ideal angle to the green, which is protected by three bunkers. Arguably the easiest par 3 on the course, the third hole requires an accurate tee shot, ideally under the pin. Misses too far to the left may find O.B. This hole requires an accurate tee shot with a mid-to-long iron. Beware of the hazard cutting across the end of the fairway. The approach to this elevated, small green is tougher than it looks. The approach to this dogleg left par 4 requires an accurate shot towards the 150-yard pole. Two large hazards make for a difficult approach to the green. Long hitters can reach the green in two shots if they get around the fairway bunker. Be careful of the hazard that runs along the entire left side of the fairway and crosses it. A bunker short left guards the small green. The shortest par 3 on the course plays about one club longer for most hitters due to the elevated green. Watch your distance and the wind direction on this hole to avoid the bunker short left. This hole generally plays into the wind. A tee shot down the middle or to the right side of the fairway will provide the best view into this green. You will need an extra club on your tee shot to reach the elevated green on the first of two difficult back-to-back par 3’s. Avoid the bunker if you want a chance at making par. The opening hole on the back nine is a long par 3, but plays one or two clubs less for most players due to the elevation drop from the tee box. Do not miss this green left or long. This challenging par 4 requires precision off the tee. The fairway is lined by O.B. to the right and a hazard to the left. Keep your shot down the middle to have a chance at par. This hole is reachable for most long hitters. 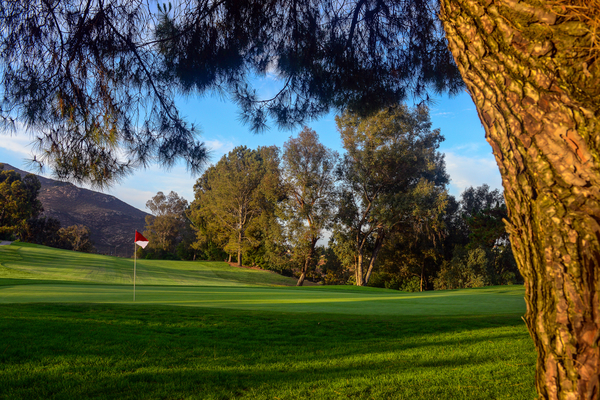 To reach the green in two shots, keep your tee shot down the middle. Do not pull your drive too far to the left or you may end up in the hazard. Any approach shot to the green that misses short or to the left may find the bunker or hazard because of a right-to-left sloping fairway. This hole is another tough par 4 requiring an accurate tee shot down the middle or to the right side of the fairway. A good tee shot will provide a great view of the green. On the fairway, watch out for a hazard on the right and O.B. on the left. This lengthy par 5 requires a good tee shot down the middle to avoid the trees and a hazard. Par is a good score on this long hole. 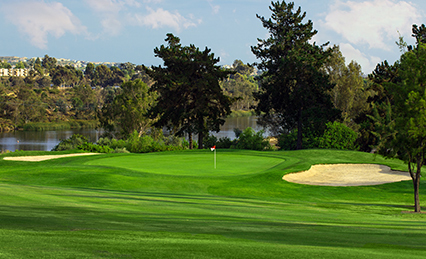 Don’t be fooled by this short par 4. An accurate drive is required to make par. Trouble borders both sides of the fairway and a greenside bunker protects the green. The ideal tee shot for this hole will be down the left side of the fairway, providing a good angle into the green. Don’t miss too far to the right or your ball will roll down into a wasteland. 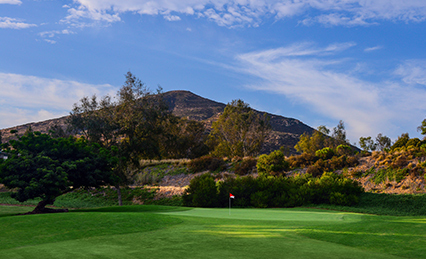 Considered by many to be the signature hole of Mission Trails Golf Course, hazards and O.B. abound. An accurate tee shot is needed for a chance at par. The finishing hole is a short par 4 that climbs towards the clubhouse. Long hitters may be able to get home with their drive, but most will choose to lay-up short to allow a short iron into this green. Be mindful of the hazard that cuts the fairway in two. Ensure that your approach is under the cup to give yourself a shot at par. 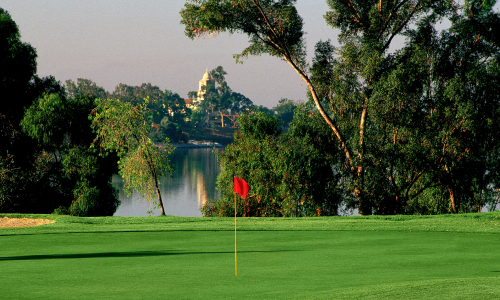 Designed by renowned architect William P. Bell in 1964, Mission Trails Golf Course is a challenging day of golf for all skill levels. 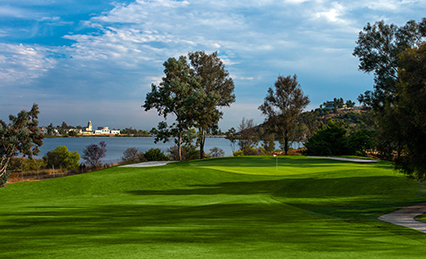 The par 71 course emphasizes shot placement on the front nine holes, then spreads to a more traditional layout on the back nine as it moves to the shores of Lake Murray. The signature seventeenth hole is a 215-yard, par 3, which plays downhill through a narrow opening and is guarded by a hazard and O.B. The lighted, grass tee driving range is open daily until 8:30 p.m. in the summer and 7:30 p.m. in the winter. We also offer two practice putting greens. (619) 460-5400 or click here.